Three Award Coordinators from Lithuania are kindly invited to take part in the training ‘Manage the Award in an Award Unit’. Erasmus+ KA2 project “Non-Formal Learning in the Formal Education System" n° 2018-3-BG01-KA205-061035 is a partnership between Bulgaria, Czech Republic, Lithuania and the Netherlands. The project aims to share good practices in the field of non-formal education happening in the formal education system in order to address and develop life skills that are critical for personal and professional development of the young people in Europe. It will also collect, structure and disseminate good practices in the field of non-formal education that support the school vision as a centre for learning and personal development. As a result, online toolkit will be developed to promote the non-formal learning and its practices in school environment. Based on the key competencies that teachers should develop in order to successfully carry out non-formal education in the schools, as well as be drivers for extracurricular activities, four diverse short term training activities will be carried out in which 64 teachers from 4 countries will take part. 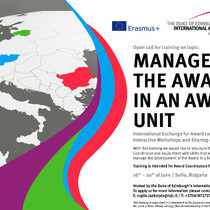 Three Award Coordinators from Lithuania are kindly invited to take part in the training ‘Manage the Award in an Award Unit’. The aim of the training is to strengthen the role of an Award Coordinator and equip them with skills that will enable them to manage the development of the Award in a licensed unit more effectively, as well as to manage a team of teachers and other staff who work with non-formal programme in school settings. The training will also be a platform for international exchange, interactive workshops and sharing of good practices. Travel tickets (up to 275 Eur) to Sofia, Bulgaria. Accommodation, 3 meals per day and training material costs. To be an independent user of the English language (i.e. understand main ideas of a more complex topic (like this call), be able to communicate spontaneously, be able to produce a detailed text). To actively take part in the training and in the preparation of the toolkit chapter on the management of an Award unit. Be willing to share good practices in your school after the training. Sign the contract of participation in the project. We invite participants to apply for this training and fill out the online APPLICATION FORM and submit it until 28 April, 2019 (midnight). Application forms sent after the deadline will NOT be accepted. Selected participants will be informed until 3 May, 2019.